Contrary to some news items posted on certain websites, Hyperion Entertainment CVBA is not in a state of bankruptcy. Due to an unfortunate set of circumstances, the company was temporally listed as “bankrupt” despite the fact that the conditions for bankruptcy were never met and that in the eyes of the law, the company was never bankrupt. The company is in the process of reorganizing itself by opening up its shareholder-ship and appointing a new executive director. More details on that will follow when all legal formalities are behind us. We appreciate your support and we look forward to meet you at any of the upcoming celebrations of the Amiga’s 30th birthday! Good to see an official statement from Hyperion Entertainment concerning the situation that arose a while back. There has been a lot of speculations on various discussion forums, social media and so forth, but now we all know the status. Now that is certainly good news. We can still expect more products of Hyperion Entertainment. The AmigaOS 4.2 has been long coming, and it would be a shame to stop the development. 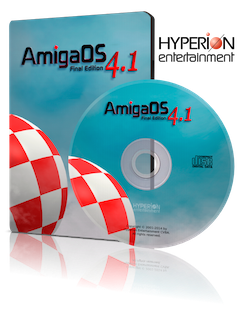 Good luck to Hyperion, and hope that all the help will help see AmigaOS 4.2 to completion. Hi there! Thanks for your comment! I’m happy as well that Hyperion is still going strong. 🙂 Will be exciting to follow the future developments of the OS.